Pictorial Quilt (American, Athens, GA), 1895–98. Harriet Powers (American, 1837–1910). Cotton plain weave, pieced, appliqued, embroidered, and quilted. Bequest of Maxim Karolik (64.619). Photograph © Museum of Fine Arts, Boston. The historic contexts surrounding the iconic quilts made by former Georgia slave, Harriet Powers, are so fascinating and rich. Only two of her quilts are known to survive, and each is housed in a major Museum collection. Her earlier quilt, known as the Bible Quilt, is at the Smithsonian, and the Pictorial Quilt, made ten years hence, is here at the Museum of Fine Arts, Boston. In last month’s post, I explored accounts related to the earlier of the two quilts: stories and texts that gave rise to a fuller understanding of the maker herself. With that as an introduction, let’s now take a closer look at the quilt we so proudly steward and cherish here in Boston. Detail: Pictorial Quilt. 1st row above (blocks 3 & 4), 2nd row below (blocks 8 & 9). Photograph © Museum of Fine Arts, Boston. It is not known whether the Pictorial Quilt was created by Harriet Powers on commission, or whether she sold it after it was completed, but we do know that her quilt was presented as a gift by female faculty members, or wives of Atlanta University professors, to Presbyterian minister Rev. Charles Cuthbert Hall (1852-1908) when Hall was serving as a member of the University’s Board of Trustees. Those who read my previous post on Harriet Powers and her quilts will recall that in 1895, Jennie Smith, the young artist/educator who purchased the Bible Quilt from Powers, placed it on exhibit at the Cotton States and International Exposition in Atlanta, GA. It is quite possible that the women who had ties to Atlanta University saw the Bible Quilt at the Exposition, were impressed by what they saw, and approached the maker about creating another quilt. The year of the gift is thought to be 1898, marking the beginning of a stable home for Harriet Powers’ Pictorial Quilt in the life of the Hall family for six decades. For some portion of those years, the quilt was hung in a Victorian summer home built by Charles Hall in Westport Point, MA, which he named “Synton House.” It was installed with simple tacks on the wall of the 2nd floor hallway. After Charles passed away in 1908, his eldest son Rev. Basil Douglas Hall (1888-1979), also a minister, inherited the quilt when he was twenty years of age. Detail: Pictorial Quilt. 2nd row above (blocks 8 & 9); 3rd row below (blocks 13 & 14). Photograph © Museum of Fine Arts, Boston. The Pictorial Quilt’s story takes a turn in 1960, when Basil Hall was seventy years of age, and finances were tight. At around this time, he sold Synton House to his son-in-law, George Utter. He also decided to gather up the family quilt, along with notecards inscribed with handwritten descriptions of each story block, and a small photograph of Harriet Powers taken around the time of the quilt’s gifting to his father—removed them from Synton House—and brought them to the textile department at the Museum of Fine Arts, Boston. This moment was indeed a turning point, as Basil Hall offered to sell the quilt to the MFA, leaving it temporarily in Cavallo’s care as the proposition was taken into consideration. Detail: Pictorial Quilt. 1st row above (blocks 1 & 2); 2nd row below (blocks 6 & 7). Photograph © Museum of Fine Arts, Boston. Detail: Pictorial Quilt. 3rd row (block 15). Photograph © Museum of Fine Arts, Boston. With Adolph Cavallo as intermediary, Maxim Karolik readily agreed to purchase the Pictorial Quilt from Rev. Basil Hall with the intention of gifting it as a bequest to the MFA. Karolik passed away in 1963, and a year later, the Pictorial Quilt and its related documentation formally entered the collection of the Museum of Fine Arts, Boston. The Pictorial Quilt is impressively large: 69″ x 105.” Its presence in the confines of the upstairs hallway of Synton House must have loomed large, especially for the children and young members of the family who must have spent countless hours together upstairs, away from the adults, captivated by the lively spirit and storytelling qualities of Powers’ magnificent quilt. Robert Utter, a great-grandson of Charles C. Hall, recalled spending many weekends at Synton House and remembered he and his younger sister Loraine making up their own tales about the quilt blocks. I picture in my mind’s eye the imaginary universe conjured by these young siblings, bringing them close to the quilt—free to explore the multi-patterned fabrics and appliqué shapes with their fingertips—extending the quilt’s life as an object imbued with creative vitality, and becoming a part of it. In a series of telephone interviews in 2008 with Kyra E. Hicks, author of This I Accomplish: Harriet Powers’ Bible Quilt and Other Pieces, Robert Utter shared his recollections of the Pictorial Quilt and would go on to divulge a long-held personal secret, the memories of which surfaced upon his first direct encounter with the quilt some forty years later. 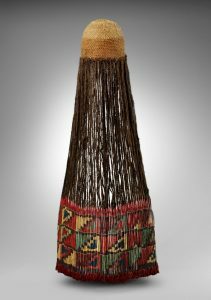 The year was 2001, when the MFA organized an exhibition to showcase the Museum’s growing folk art collection. American Folk prominently featured the Pictorial Quilt, regarded by many to be the single most important object on display. Robert Utter’s mother organized a family excursion to the Museum to visit the quilt that in 1964, had been accessioned into its textile collection. The young Robert Utter—using a Bic® ballpoint pen with black ink—drew eyes on some of the figures. Detail: Pictorial Quilt. 2nd row (block 5, with penned-in eyes). Photograph © Museum of Fine Arts, Boston. Well, we know that Robert Utter drew some of the eyes—the others were appliquéd by Harriet Powers to the quilt top. But Utter’s admission did resolve a puzzling question for some familiar with the Pictorial Quilt, who wondered why Powers would solely hand-stitch the eyes on her Bible Quilt characters, then use two separate methods to achieve the same purpose on the Pictorial Quilt. This is purely speculative, but my own thought is that Harriet Powers intentionally appliquéd some of her figures with eyes and chose to leave some without—achieving a particular aesthetic result that was pleasing to her. Detail: Pictorial Quilt. 1st row (block 3, with penned-in eyes). Photograph © Museum of Fine Arts, Boston. Stories such as this one, involving a child’s creative impulse, locates the Pictorial Quilt in a living relationship with human actors throughout the life of its history and makes me wonder what Harriet Powers would have thought of the young boy’s inspired additions to her quilt? 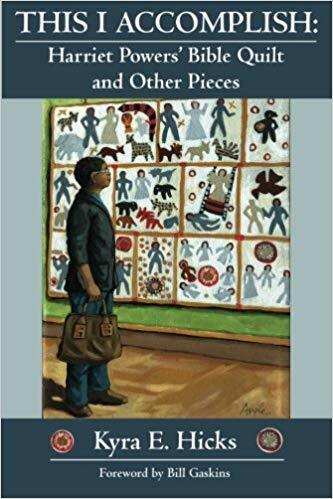 Author Kyra Hicks includes comprehensive resources pertaining to Harriet Powers’ quilts’ histories and exhibition records, annotated bibliographies, and timelines in this book. Kyra E. Hicks, author of This I Accomplish: Harriet Powers’ Bible Quilt and Other Pieces (Black Threads Press, 2009) is credited for providing the primary source material for this post. Her book is a comprehensive resource, and a must-read for any person interested in learning more about Harriet Powers and her quilts. I find pleasure and inspiration in Hicks’ highly personal accounts that engender for her readers a sense of excitement and suspense as she follows her nose to uncover myriad details. I also appreciate the questions that she poses for herself, and for her readers, in the process of piecing her research together. Throughout her book, one experiences the author’s palpable reverence for the person of Harriet Powers and her creative mind. There is still more to come on this subject. Until then, you can explore close-up images and descriptions of each of the fifteen quilt blocks, as told in the artists’ own words, on our collections page at mfa.org.